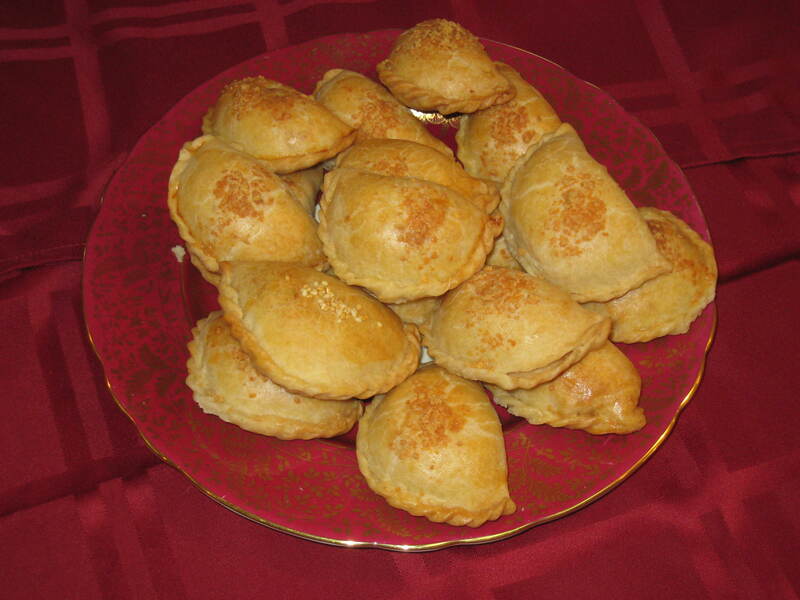 An absolute favorite in any Sephardic household…….and to any guest at a Sephardic table…..is the bureka! A flavorful, savory, tasty filled pastry that can simply melt in your mouth! Each community has their unique varieties; each family, their favorites! 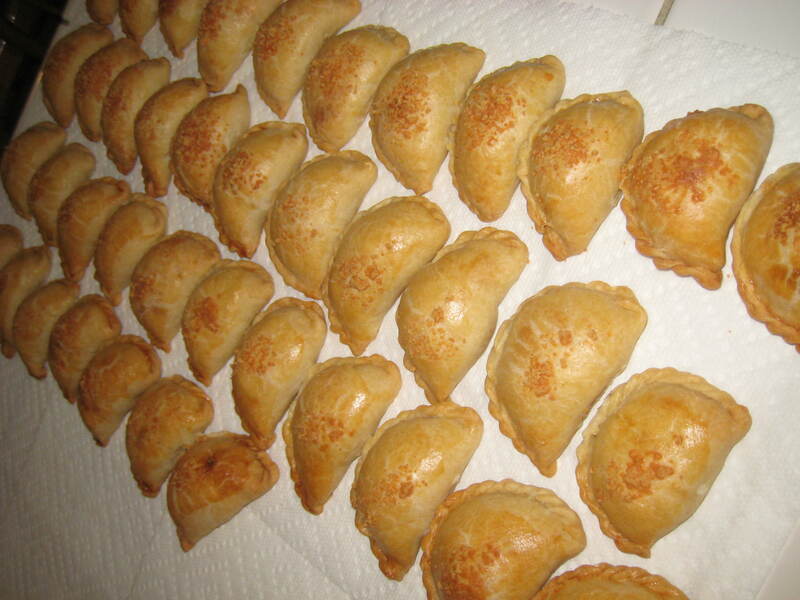 Our “Rhodesli” family, (from the Island of Rhodes, currently Greece, but in the times of our family, a Turkish or Ottoman possession) loves this moon shaped pastry, filled with a “conduchu” (filling) of rice and cheeses, as well as those filled with a mouth-watering mixture of sautéed eggplant, onions and tomatoes! My grandmother was always baking burekas in the kitchen, along with lots of other homemade goodies! I remember my mom and her aunt spending hours preparing and baking these treats, and the amazing aroma that filled the house when I got home! As our sons have grown, Grandma’s burekas have been a favorite for snacks, special meals, breakfast….even in their lunch boxes! I think they are my husband’s favorite Sephardic treat. They are flavorful, delicious and definitely filled with love!!! Now that I am learning the art alongside my mom, I can absolutely appreciate the work, skill and patience that goes into making them. My mom came to bake today and we made burekas of both kinds. The house smells heavenly! I am learning from her the joy of baking and of sharing these very special treats!!! Here we share her recipes and some of her tips on making them. Let us know what you think! Begin by making the filling. Bring water and salt to boil. 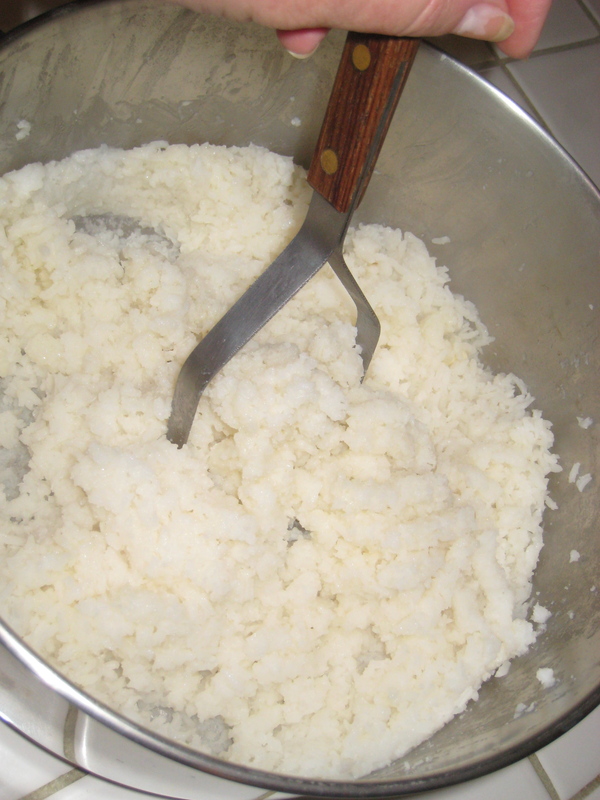 Add 2 Cups rice (rinsed and drained), cover, and keep on a simmer flame until all the water is absorbed. (Prox 30 minutes constantly watched.). Remove from flame; allow to cool! Mash rice w/potato masher; Add cheeses and eggs and continue to mash. Mixture should be damp, not dry. Fill measuring cup with ice cubes, add water to 3 C mark on measuring cup. In large mixing bowl, add mix of water and ice, oil and salt. Let stand for as few minutes for water to get ice cold before beginning to add flour. Continue to mix. 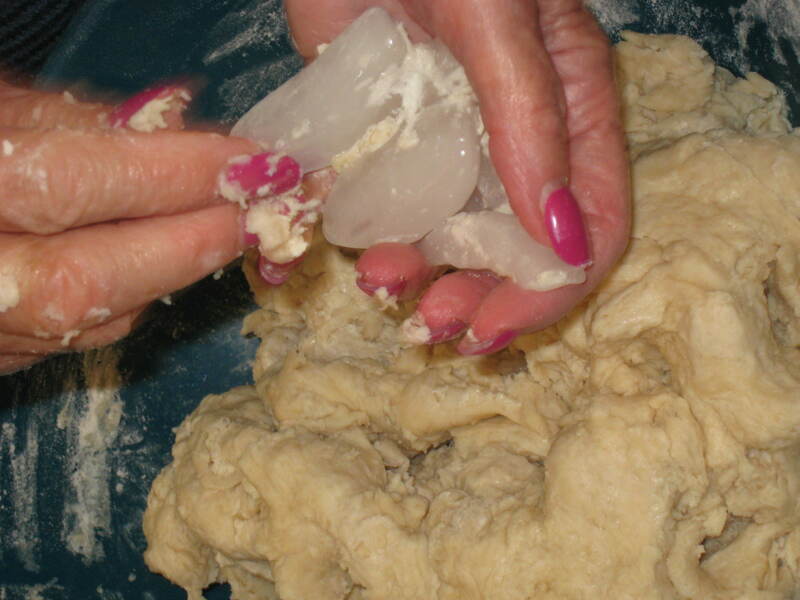 As flour begins to take on elastic consistency of dough, remove ice cubes. Knead until dough is not sticky and has the consistency of a pie dough. Separate dough into 4 portions. Pinch off “walnut” sized balls and place on a work surface. Work each ball in the palm of your left hand (if you are right handed). Use your right hand to tuck the dough under and into itself, working to make it a smooth ball. As balls are formed, place them on a parchment lined baking sheet. Once all the balls are prepared and the dough has had a chance to “rest,” begin by placing 6 balls on work surface. 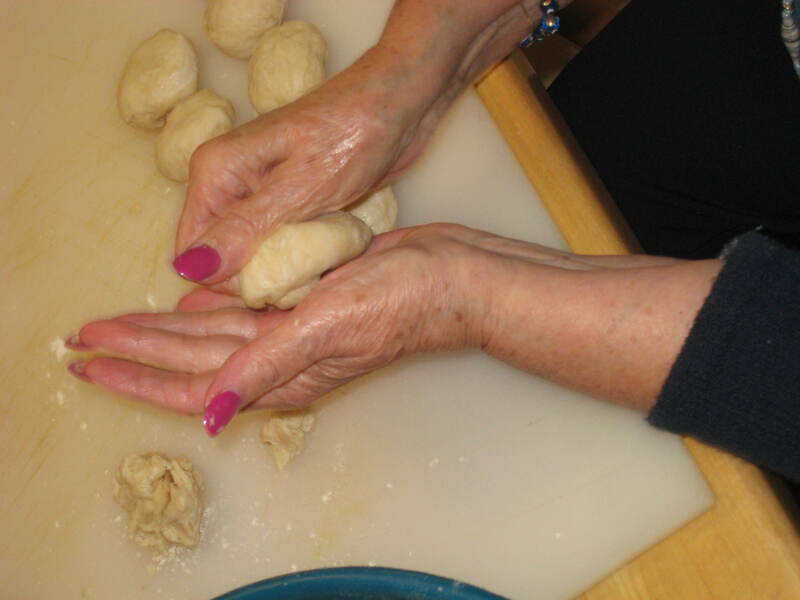 Using your fingers, press out the dough; then, with a small rolling pin, make oval shaped, flat forms. Using a tablespoon or small scoop, scoop filling into the middle of the flatten dough. After all 6 have been filled, fold each on in the middle, pinching the edges shut and making a moon shaped, filled pastry. You can make a beautiful edge by pinching and rolling under the edges (see video clip). Or you can use a fork to crimp the edges with a nice, clean pattern. (Remember, you “taste” first with your eyes.). Continue with all the dough. This recipe SHOULD make approximately 84 burekas. Place on parchment lined baking sheets. Using a pastry brush, “paint” with a wash made by beating an egg and 2 drops of water. Finish with a sprinkle of grated cheese. Bake in a 350 degree oven for approximately 30 minutes…or until golden brown. They are divine right out of the oven! Can be frozen and easily be warmed again in oven or toaster oven. Note: Microwave makes them soggy. Great for a brunch!